SUMMARY: While the MarketingSherpa team is preparing for MarketingSherpa Summit 2017, we continue to explore the results of the MarketingSherpa consumer and marketer surveys. Discover the results of a recent study with 2,021 U.S. consumers about preferences to receive messages when they are away from computers. While the MarketingSherpa team is preparing for the 2017 Summit, we continue to explore the results of the MarketingSherpa consumer and marketer surveys. This week we take a look at the ways customers who are away from computers want to receive messages from companies, and compare it to the ways marketers use to communicate with customers who are away from computers. MarketingSherpa commissioned an online survey that was fielded August 20-24, 2015 with a nationally representative sample of U.S. consumers. We asked consumers, "Which of the following methods, if any, do you prefer companies to communicate with you when you are not at a computer? Please select all that apply." These were followed by a sizable portion of consumers (15%) who preferred not to receive any messages when they were away from computers. In last week's chart we looked at 455 marketers' answers to the same question, rephrased to reflect a marketer perspective, "What ways do you offer for customers to engage with your brand? Please select all that apply." Let's look at the top preferences of consumers, and how marketers' practices match up to them (or don't). Text messages (20%) and billboards (17%) were also slightly less popular among marketers than among consumers. Eighteen percent of marketers said they used text messages and 15% said they used billboards. 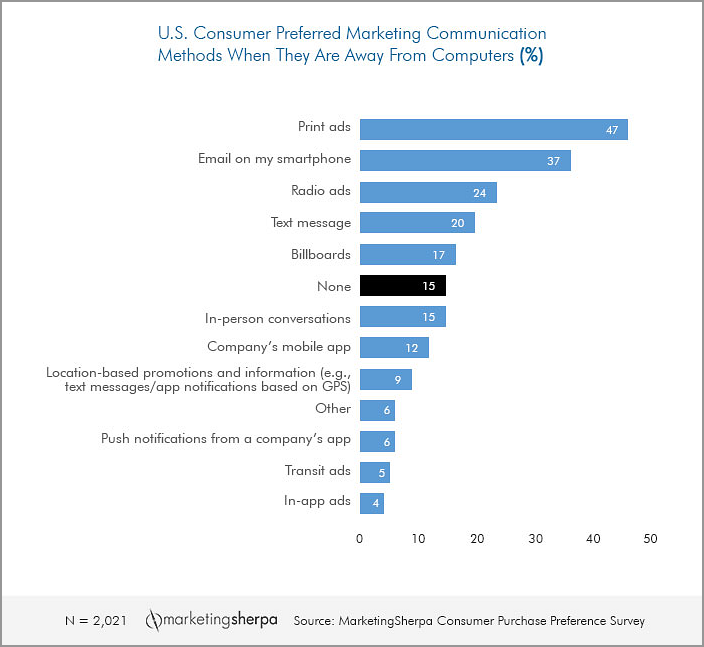 To sum up, marketer's practices of ways to reach customers when they are away from computers are somewhat misaligned with consumers' top choices of ways to receive messages from companies when away from computers. People prefer to look at print ads and listen to radio ads more than marketers tend to offer, while marketers try reaching customers via email on smartphones, in-person conversations and brands' mobile apps more than their audience tends to prefer. It's perhaps not a surprise that marketers emphasize electronic ways of reaching their audience over print, since the latter is more costly and harder to attribute in the customer sales journey. Also, smartphones and email on smartphones occupy an important place in people's lives and offer new ways to serve the customer with location-based promotions and information. However, consumers still seem a little cautious about location-based communication when they are away from computers.